Term 3: Traders and Raiders! Term 4: Misty Mountain Sierra! In Oak Class, our children are off to a flying start! Already we are becoming more confident readers, writers and mathematicians. Our Year 1 children are tackling a big transition seamlessly. As school life effortlessly falls into place, our Year 2 children find themselves our oldest infants and take this responsibility very seriously, conscientiously helping youngest children in and around the school. In Maths, our Year 2 children have been developing their understanding of place value. Our Year 1 children have been working on representing numbers in different ways. The children have been using their reasoning skills to solve problems that are presented in a variety of ways e.g. numbers, words and pictures. In English this term we have been learning about the adventures of Iggy Peck, Architect. The children have been charmed by this rhyming text, and often surprised by some of Iggy's more inventive creations (like the tower he built out of used diapers). We have been busy creating our own London factfiles for Iggy's visit to London! Stomp, crash, RRRAGH! Watch out everyone - the dinosaurs are on the prowl! 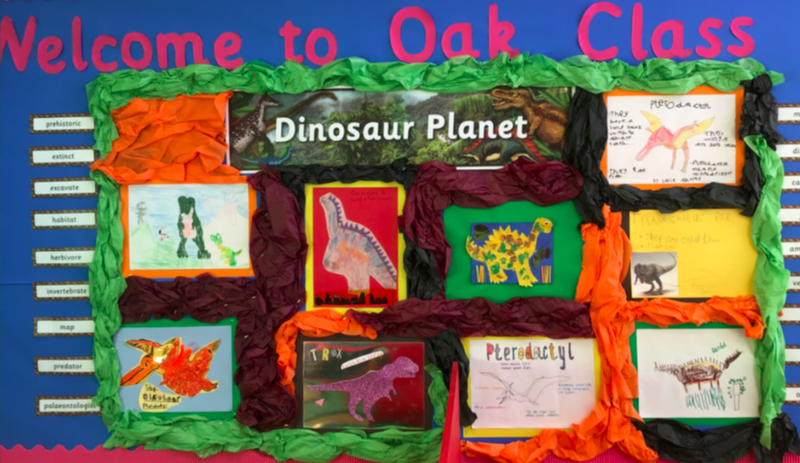 The children have wholeheartedly engaged with our Dinosaur Planet topic. We have created some fabulous dinosaur drawings and I was hugely impressed by some of the small-scale models- Well done, Oak Class!